Promotional custom apparel has endless values and possibilities to reach the prospective audience, sponsors, partners, employees, and customers at events. According to statistics, Custom T-Shirts are the second most popular promotional item that encourages and supports campaigns, organizations, causes, or events. We have extensive high quality screen printed, performance, premium, ladies, youth Polos and custom long sleeve shirts that will act as the walking billboard for your brand! Order our custom polo shirts with logo for creating the ideal giveaway, team, volunteers, and visitor promotional apparels. Creating the perfect looks, our custom youth t-shirts and youth sports shirts will grab everyone’s attention! We also have custom women's clothing in varied colors, styles, and designs that will provide high visibility of your featured logos, mascots, and messages. 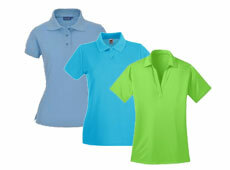 So, create the right impression and promote your event with these promotional apparels. Their impactful quality, colors, stylish and polished appearances will create marketing buzz at events! 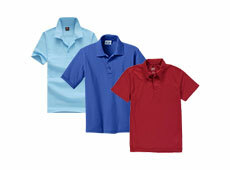 Order our extensive Custom Polos Apparel to build the brand recognition. Get the impressive stylish designs to create unique looks with our Custom Polos Apparel from the youth, men, and ladies collection. 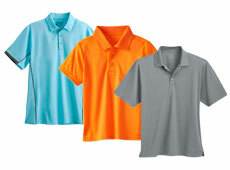 Our wide-ranging collection of custom dri fit polo shirts from Adidas, Russell, Jerzees, Hanes, Bella, Anvil, Gildan, Dickies, Devon & Jones, and Alo Sport will create the personalized look you want for your team or event. From our selection of polo designs, you will be able to choose your Custom Polos Apparel to spread the name of your brand and create ultimate brand exposure at events. Find the right custom polo shirts with logo that will promote your brand with your well-designed graphics and messages on them! 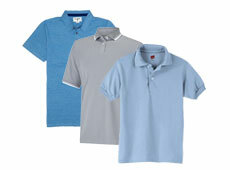 Make your marketing investment a success with your well thought out selection from our extensive Custom Polos Apparel. They will prove to be the best form of advertising when your visitors, patrons, and team members will wear these Polos at events. 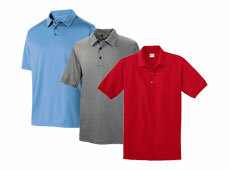 For giveaways, our Custom Polos Apparel will let your employees show your brand logo with pride! Anyone who will be seeing these custom polo shirts with your brand name emblazoned would not miss the message you conveyed.